Despite the fact that I've written a handful of complimentary posts about myself, I'm not one to toot my own horn very often. That said, though I rarely claim to be smarter than anyone, I have to admit that I'm a fairly intelligent guy. Despite this, I've written about things I don't understand in the past, and it's been quite a while since I have, so I feel it's high time I embiggen the list of things I just can't seem to wrap my mind around. Of the myriad things I just can't fathom, I think I understand smoking the least. With all of the health problems that cigarettes cause, I simply can't understand how anyone these days could possibly begin (or continue) smoking. Now before anyone starts yelling and screaming that nicotine is addictive, I ALREADY KNOW. I know how easy it is to become addicted to cigarettes, and I know how difficult it is to quit once you're hooked. But it's a rare soul who doesn't know at least one person who was affected adversely by cigarettes - lung cancer, emphysema, chronic bronchitis, oral cancer, cataracts, heart disease, stroke . . .
And yet, people still smoke. "GET TO THE POINT, DOC!" I can hear you screaming. I got a call from an emergency physician some time back for Samuel (not his real name©), a gentleman in his 50s who had a history of severe peripheral arterial disease. If you've never heard of PAD, it's very similar to coronary artery disease, except that instead of the arteries of the heart getting blocked by gunk and causing a heart attack, it's the arteries in the rest of the body (including the legs, intestine, etc) that become blocked, causing all the tissue downstream to die. The most common causative agents are smoking, diabetes, hypertension, and high cholesterol, all of which Samuel had or did. 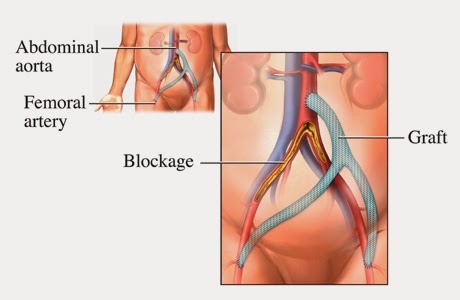 About a month prior to coming to my hospital, Samuel's aorta, that rather-important artery that comes off the heart and supplies blood to the entire body, had become completely blocked at the point where it splits to supply blood to the legs, so a bypass surgery was done at an outside hospital. Today Samuel was having severe abdominal pain, so the emergency physician correctly presumed that he was having a complication from that surgery. He promptly ordered a CT scan of his abdomen which fortunately ruled out any complication of his bypass (such as a leak or infection or blockage of an artery), but it surprisingly showed a small bowel obstruction. His small intestine was dilated to about 8-times its normal diameter, but more even more ominous was that it looked like the blood supply to a segment of the bowel had twisted on itself, an entity called intestinal volvulus. Any tissue whose blood supply is twisted will eventually die, so this is a dire surgical emergency. Thirty minutes later he was in the operating theatre, and 30 minutes after that I had successfully untwisted his intestine, which was perhaps an hour or so from dying. As you can probably imagine, that's not a good thing. I watched it for a few minutes, waiting for the colour to normalise (it did), and then I closed him up. Another life saved! "When are you going to quit smoking?" Her smile immediately faded, and she looked at her feet. "We're trying to quit," she almost whispered. Wait . . . we? Are you telling me this man who nearly lost his legs a month ago because of his smoking is STILL SMOKING? With a stern look and not even a hint of mirth, I told her that she and Samuel had to quit. NOW. "I don't care if you go cold turkey, use nicotine gum, a nicotine patch, prescription medicine, chewing gum, e-cigarettes, meditation, yoga, hypnosis, acupuncture, or voodoo," I said, trying not to yell. "Your smoking was making him smoke, and his smoking is killing him, slowly but surely." I sent Samuel home a week later, repeatedly beating my point into his skull daily. Unfortunately (though perhaps not surprisingly) he never showed up for his follow-up appointment. I don't expect perfection, except from myself (though I rarely attain such heights). But I do expect people to help me help them get better. Why can't (or won't) so many people do that? Yet another thing I don't understand. I don't understand smoking either. I know most people start before they are even sixteen - faking IDs, getting older smoke-buddies to buying for them, stealing,... I get the urge to rebell against your parents at that age. But why would you then go and inhale stinky poison? By all means, wear jeans ten sizes to large around your knees with a distinctive waddle, grow your hair out, gel it up to new hights and dye it in crazy colors, listen to music that causes your parents' ears to bleed, but don't start smoking! I know a guy that spent a great deal of time in a nursing home following a heart operation. He was in and out of the hospital during his stay there. They told him to cut out his salt or he would die. While he's recovering, he's complaining left and right about the nursing home not watching their salt and it's making his legs swell, slowing his recovery, etc... Follows it up with this gem "Yeah, I can't eat their food. I have no choice but to go to McDonald's every day for lunch. They're trying to kill me". I wouldn't try to understand these people's logic. The more you try, the more you'll want to bang your head against the wall. you just have to accept that their priorities are different than yours - and that they are set in the belief that you have the technology to erase the consequences of their priorities. sounds to me like a classic case of smoker's insensitivity. I'm guessing she also tends to just drop her butts wherever she finishes them. Hey Doc, I'm attempting to quit smoking now and I wanted to know your views on e-cigarettes. I have recently bought one but have heard all the rumors going around about how they are worse for you than actual cigarettes and wanted to know your opinion on the subject. the official statement on them is they don't give you the combustion products, so you have less hazard - but on the other hand - the only way to quit is to ultimately overcome the nicotine addiction. if you use them as a tool to help get free from the nicotine they are a benefit - if you are just changing delivery methods, then all you are doing is reducing the number of possibilities of how your addiction can kill you. the major risk from e-cigs is abusing the liquid. This reminds me of the elderly couple that seated into my compartment in the train. He clearly was wearing a prosthesis on one of his lower legs. After a while, before he started to talk to his wife, he pressed a vibrating device to his larynx. That in turn reminds me of a family friend whose mother died from lung cancer. as the friend was making the deathbed visit, the mother was still determinedly smoking cigarettes. when the friend demanded that the doctor had to make her stop smoking, the doctor replied, "what's left to threaten her with?" My husband had an Aortic Dissection a couple of years ago (in his 40's) after being in ICU for a period of time in an induced coma and nearly losing him, you can understand why I went nuclear on his arse when the very next day after waking up, I arrived at the hospital to find he had bummed a cigarette off someone and was sitting in a wheelchair, in the garden puffing away. Going through this with my mother and stepdad. Mom: diabetes, hypertension, familial hypercholesterolemia, atrial fib (after quad bypass 4 years ago) and COPD. Possibly some dementia cooking as well. Stepdad: COPD, asthma, bowel problems from too much alcohol ("But I'm not an alcoholic"). How those two can justify lighting up a cigarette is beyond me. I can't stand going into their house. I'm sucking on my asthma inhaler like a fiend—the house cats stay outside most of the day because they can't stand the smell (but like the warmth at night, so they curl up in one of the spare bedrooms). I do not smoke. Never have (well, tobacco anyway, and I gave that other stuff up 35 years ago). I understand this. My family tried a lot of things to get my grandmother to stop smoking. I listened to her drown in her own lung fluids while a sophomore in high school. yelling at patients to "get" them to stop smoking or lose weight is not effective if your goal is to get them to stop smoking or lose weight. try a softer approach. as in lower your voice, fake some empathy, and tell it straight. you might be surprised.